Peter and Barbara Snape’s second visit has been long awaited. 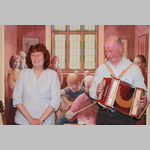 Barbara’s lovely clear voice with Peter’s sensitive melodeon accompaniment means you are in for a real treat. They present a varied repertoire of traditional folk song complemented with an eclectic selection of music hall songs, Lancashire looms large but they are equally at home tackling songs from all over the British Isles. Bring your voices for the choruses.